Puzzle Pirates Forums - Print Thread - XMAS IN JULY -24 hr WB pilly.. lots of prizes!! 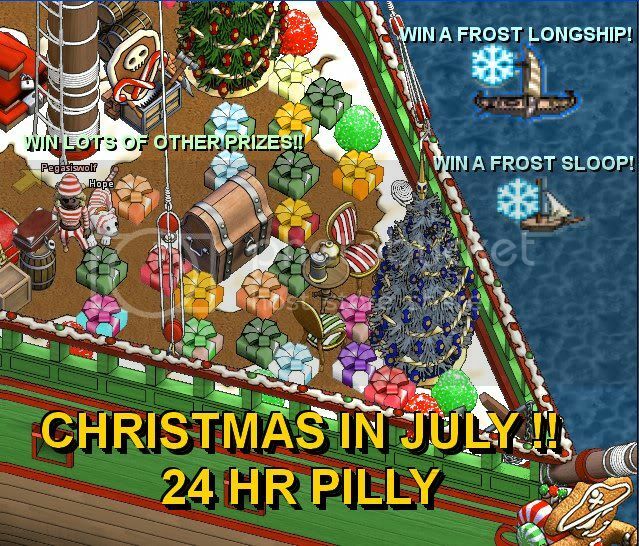 » » » Thread: XMAS IN JULY -24 hr WB pilly.. lots of prizes!! XMAS IN JULY -24 hr WB pilly.. lots of prizes!! Dream Catchers is doing an XMAS IN JULY event!!! note: the presents will be handed out for fun reasons as we go (could be top station.. could be funniest joke.. could be last one alive in the fight.... could be the first person to click trade with me.... could be about any reason we think of at the time).... should have enough prizes to hand out about 2 every hour!!!! HOPE TO SEE EVERYONE THERE!!!! BRING YOUR FRIENDS!!! "maintaining a positive attitude may not fix all of lifes problems, but it should annoy enough ppl to make it worth the effort"
Re: XMAS IN JULY -24 hr WB pilly.. lots of prizes!! Sounds funnnnn ^_^ Will try to be there. If it floats, shoot at it! "It's not so much that I'm an atheist so much as it is the sneaking suspicion that I myself may be God." The legend of Twisted Parallax lives on. with everyone dressed in stripeys.. could be hard lol... but good idea to do a "first one to find and click trade with "thispirate".. get a pressie!! Captain, SO, FO and CP of The Conglomerate. Castor tells ye, "I'd go get some sleep!" and of course ill be happy to let ya guest bnav here and there... but since ive been stuck at illustrious bnav since.. 2007!! i would like to do a bunch of the bnav myself and finally get my sublime!! im all excited.. june go away.. bring on july!! I deleted my pirate because I got a slightly less depressing real life. The xmas spirit has hit Sage!!! Special thanks to all the pirates that have been donating even MORE prizes!!! because of you guys (ALL of u.. not just those mentioned).. there will be some really great items to be won by everyone.. I'll try be there, sounds like fun either way and thank you for running it! yay.... Apollo has agreed to Rename the Frost ships before the event ....for free!!!! (not the plain ones tho)... so the prizes will now be RENAMED LE FROST longship and sloop.. I will post the names once i think of some names and get them approved. Will their be any Sub-Events inside the "Pillage". For example. Will there be occasional Viking + IO + BK Compasses to do for a lulz? Nice event to revive the "Pillage Industry". Pillage Industry for the win! "That moment when you realized you are born 9 months after your father's birthday. Coincidence -- I think not." Please note that a recent all-islands pillage - hitting all islands on sage, taking 23.5 hours, 600k voyage total, and 61 battles - found a bug in the booty division. It only stored attendance information for the last 30 or so battles. Thus the people at the start get screwed. It is not known at this time if it has been fixed or not. There is a workaround: Port and split every 20 battles. The OMs refused to support us when we found this, and simply said to bug report it. Game Design: A place to hide all your posts from OOO employees. /e mumbles something along the lines of "read the (unintelligible) thread before you (unintelligible) post"
also... Akash has donated 2 sloops(among other things)... so we have an EXTRA sloop to give away.. so I am just gonna wrap it up (via trinket) and toss it under a tree with all the other wonderful presents!!!! good luck!!! Akash has also donated some STOCK (500 rum and 1500 small cbs).. not for our pillage... but to be WON.... so (10) lucky winners will be winning 50rum/150smcbs each!!! Gonna be so much fun. See you there (if you've got any sense at all). Have some name ideas. Talk to you in-game Pegasis. Thanks in advance for all the time and effort you've put into this. Everything has it's hiccups, but, when the day comes, just ignore the grumblers and know you are appreciated. Make it a frig pillage and accomodate more mates! My posts are not my own opinion. Tried to ban evade @ ixgoldxl, didn't work. My sleep schedule is thoroughly scuppered up and so I'm ready to stay up all night!!! WAHOO!!! --Captain of the Crew "Search For Tomorrow"
--Prince of the Flag "Say No More"
Out of curiosity will u start jobbing before 11 am or will u start jobbing at 11 am? Also its 11 am gametime riht?